Hi everyone! it’s time for the weekly development update, and we’re of with a really really boring screenshot. Yeah, you heard me! One might think: this picture looks perfectly fine. 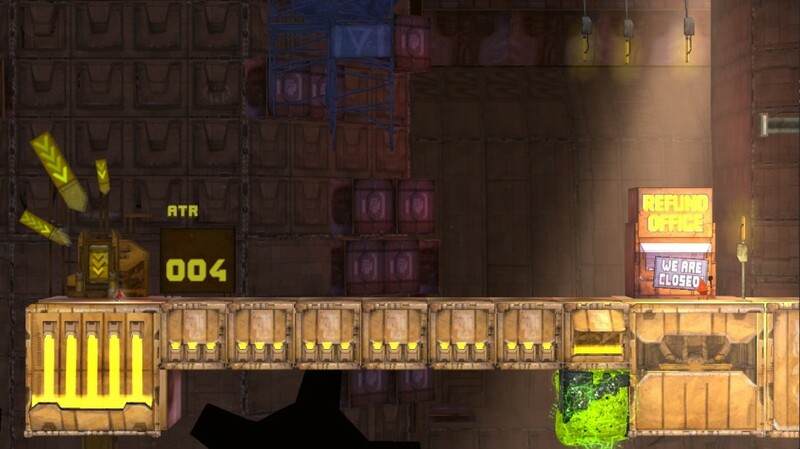 It has a stage from On Rusty Trails, Elvis is in it, the awesome lamps are there, the new slime texture has been applied. What a lovely shot. Wrong! This screenshot is a shadow of what it can be, although shadow is a good starter. Because to have shadow, we need light. And Mr. Tobi, the Bilginator, has added that – and so much more. Now that’s what I call a screenshot! Away with the brightness, we have some proper lighting and a beautiful mist in the bottom. The slime looks toxic as hell and our lamps are shining beacons of luminosity. These are things, Tobis has been holding out on us over the last weeks. He has been a busy bee indeed. Besides making the game look gorgeous, he’s had sound and music sessions with our sound guy, Steffen. He worked on boss fights and level arrangements. All stuff you will be actually able to experience when playing the game. As you can see, production is nearing the polishing phase. 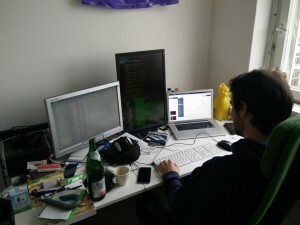 For this week’s blog, I was at the Berlin office, to work on some clerical stuff, which gave me a chance to talk to the guys directly and look over their shoulders. 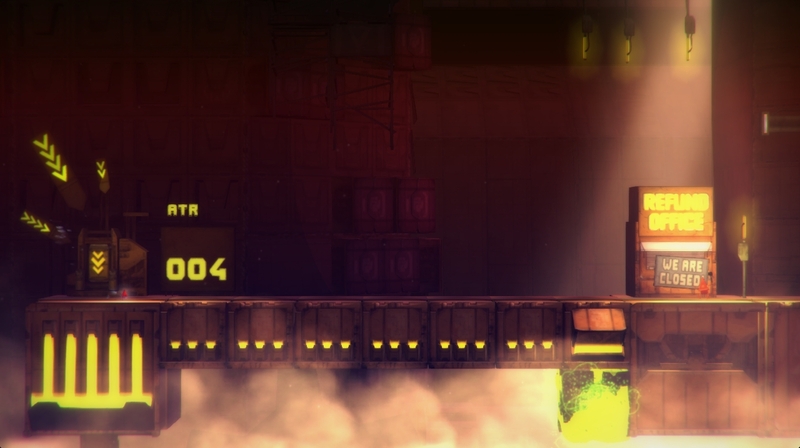 This lead to me seeing Stamm moving platforms around in a level and zooming out to see the composition in its entirety. BAM! Time for an idea. We have never before shown what a whole level looks like. So I asked Tobi and he challenged the GIFmeister crown once again. On top, you can see a 180° camera move around a whole level, although it is very bare. But don’t worry, we have more. Foreground, background, all the grounds, boom! Our friend, the storm cloud, is also still there. Isn’t it interesting, how much stuff is around the spot you can see from the usual camera position, which you might not even notice that much, because of effects and the fast pace in which the game is played. I thought, it would be a really cool thing for the blog. Another reason for my stay in Berlin was a visit from a journalist I had met in Poznan a while back. 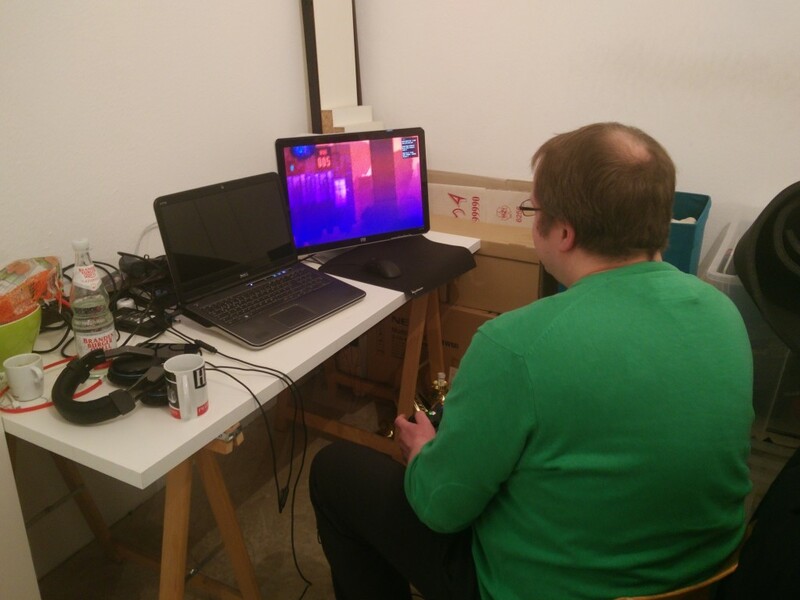 I had invited Achim to come over to the office and have a first look at On Rusty Trails, so he dropped by to play a while and also to ask us a few questions about the project, the studio, funding and indie game development. Bonus picture time. 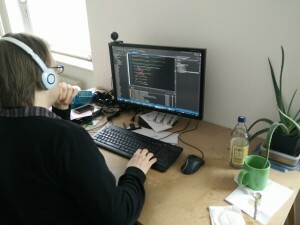 Since the blog usually focuses on the art side of the development, because it is pretty hard to convey coding things in this casual format, I took pictures of Jones and Rico at their work stations to show that they are also working hard. That’s it for this week. Make sure to check back on the blog next Sunday!